Rent a holiday house in Bayeaux, a gite in Le Luot, a large holiday apartment in Caen, or a town house in Avranches, and enjoy the peaceful countryside of Normandy and the beauty of the region's 360-mile-long coastline. A holiday in Normandy provides heaps to do, with sailing and windsurfing at Deauville, Trouville, Fecamp and Granville; boating on the river Seine; or even bungee jumping off the Souleuvre Viaduct. Enjoy horse riding, hiking and biking in the countryside, or visit the famous World War II landing beaches. Attractive 7 bed 7 bath country house in approx 2 acres of grounds, built in traditional colombage (Tudor) style of Normandy. Swimming pool and games room. For families and special occasions. 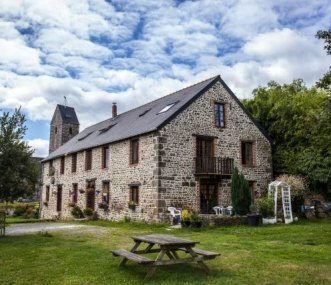 Large detached converted barn in peaceful Normandy countryside. Ideal location for groups, clubs and families. 6 en suite bedrooms. Exclusive use all year round, but B&B an option. Back to nature in beautiful Normandy. 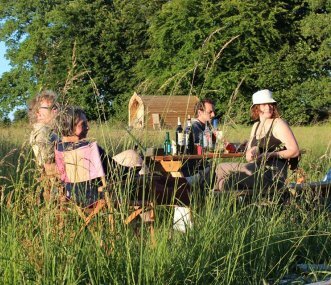 Eco glamping for 20 on a tranquil wooded 9 hectare site close to village with bar and bakery. Ideal for groups of all types. Barbecue, sun terrace and camp fires. Big venue offering flexible accommodation ideal for a group get together or family holiday, includes a cottage and gites set in acres of historic gardens in a country location. Sleeps 60.